“Digital transformation” is tough for any firm, but when you are $9 billion industrial manufacturer, it is a sizable undertaking. At last week’s TG18 ToolsGroup user event, global bearing manufacturer SKF laid out an impressive review of their transformation to “Integrated Planning”. The company is moving from location-based planning to a global planning model, including a complete revamp of its supply chain planning operations to processes organized by product and factory. This is their story. This prodded SKF to a new demand chain vision. SKF has been organized mostly locally. Planners focused on their local operations or warehouses and servicing customers in their territory. It managed local inventories fed by regional warehouses and factory warehouses (See Figure 1 below). Each echelon of this multi-tier organization was planned towards a local optimum. There was limited alignment between regional forecasts and there could be potentially different planning methods and parameters in each unit. If this sounds manually intensive, then it won’t be surprising that SKF has few hundred planners, not unusual for a company present in 130 countries with 17,000 customer distributors/dealers, but quite substantial. SKF set out to create a global planning approach with the goals of improving both effectiveness and efficiency. To be more effective, the company wanted to plan and optimize globally, rather than having to continually reconcile multiple local plans. In addition, it wanted to plan “dependent flows” together, that is planning all the globally interrelated end-to-end activities associated with one item. SKF saw potential to improve efficiency through a high level of automation across the demand chain, manually intervening when necessary to handle exceptions. This prompted SKF to make a major shift in its planning organization. Rather than planners being organized by local territories, they would have global responsibility by production line. Each product has “one global forecast, one planning method, one responsibility, and true end-to-end accountability,” says Jörg. Each planner owns the forecast and inventory globally and an end-to-end plan - and is responsible for achieving external customer service targets, as opposed to multiple independent organizations, often with more internally-focused targets. Deviations are handled globally, even though execution is often addressed locally. This shift is illustrated in the figures above. In the previous planning process (Figure 1) the planners addressed local demand. Multiple planners were often vying for the same products and resources. Inventory planning was local. Inventories themselves were often local. With the new planning model shown in Figure 2, planning is now at the product level with the planner responsible for multiple roles including procurement, master scheduling, distribution and demand planning. In their new roles, these “global planners” have the power to decide and change supply plans globally. 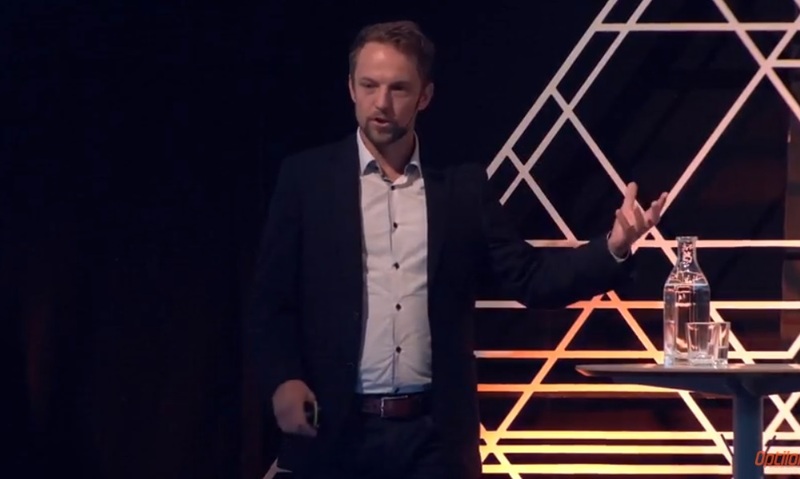 “With great power comes great responsibility”, Jörg half-jokingly quotes superhero Spider-Man – so these “global planners” are ultimately responsible for global customer service and global inventory levels. Another view of the change can be seen in the way the evolving organization aligns with the SCOR model. In Figure 3 the functional groups in the organization are managing multiple roles. For instance, Sales is not just selling, but also included in the “Plan Deliver” functions. This makes it difficult to optimize processes and creates friction from internal competition. 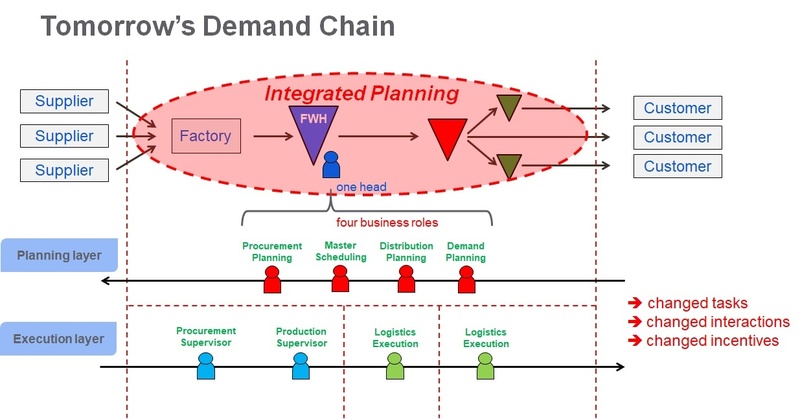 The new approach (Figure 4) allows the sale team to focus on selling while planning moves to the factories, consolidating the “Plan Source, “Plan Make” and “Plan Deliver” functions into one organization. It makes end-to-end optimizationpossible, empowers the team, and reduces internal competition. Other issues included shifts in tasks and power among the local and global organizations and even between continents. There were also performance measurement implications. Jörg says the key has been to have a vision with executive management buy-in and communicate that vision early and effectively. SKF used the approach of “think big, but start with small steps”. The implementation followed a four-phase process; Feasibility, Proof of Concept, Pilot, and Deployment. Jörg calls this approach “first trust, then thrust”. So far in the deployment, seventeen warehouses and two factories have achieved full “autopilot” status. As often happens, one significant process model improvement enables others. Like many other leading companies, SKF is not just comparing itself against companies in its industry. Instead it is looking outside and asking what is best-in-class in other industries? How can we learn from them? What disruptions are happening elsewhere that it can apply to its own business? So SKF is already looking ahead to the next transformation in the context of what some are calling “Industry 4.0” or “Supply Chain 4.0”. A number of proof of concepts have already launched. This next step involves increasing the “clock speed” of the planning cycle by taking advantage of real-time datafrom MES, logistics systems as well as smart data from sources such as sensors or the web. This type of data could further reduce latency, allowing for even faster optimization and response (Click here to see an example of this type of deployment). Jörg sees one implication of such a transformation in the SKF customer inquiry process. Right now many people are involved in fulfilling promises and replying to customers and therefore routing and following-up of customer inquiries can be tricky, with built-in latencies over email, many interactions, and not enough transparency. But he foresees a new workflow-based approach with data instantly available to a global action-taker and a highly automated approach that includes increasing customer response speed and reducing internal waste. Jörg shared an example from his own experience with Uber that responded instantly to his complaint. “Within seconds I had a reply, within minutes I had a refund,” he says. He envisions nothing less for SKF.